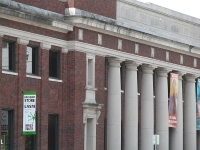 Housed in a historic railroad depot, the Louisiana Art and Science Museum offers educational and entertainment opportunities for visitors of all ages. Featured are changing fine art exhibitions, interactive art and science galleries for children, an Egyptian tomb and a simulated space station. The enormous skull of Jason the Triceratops singlehandedly justifies a visit for many. Also on the site is the Irene W. Pennington Planetarium and ExxonMobil Space Theatre, offering planetarium shows and large-format films. Capital Transportation Corporation buses on the Florida Boulevard route stop on River Road directly across from LASM making the museum easily accessible on public transport.